It's that time of the year when Lava Productions presents the subsequent edition of its "4/20" event series, but instead of coining a totally new edition title for this year's edition, the team scrolled down their archives to reload the 2011 edition --- hence they dubbed this year's (2018) edition as "Inna Mi Chalwa Reloaded", which comes off 20th April inside Akuma Village. The numerical slogan "4/20", pronounced as "Four Twenty" is the shortened reference to April 20, which is the reverse similarity to 20th April. Lava Productions uses the slogan "4/20" as its official event tag and coins a unique edition title for each year's staging. The team emphasises on the slogan's calendar relevance by strictly organizing each year's edition on 20th April, no matter which day the date fall on. Lava Productions was incepted in 2010 and had its first ever edition in 2011. 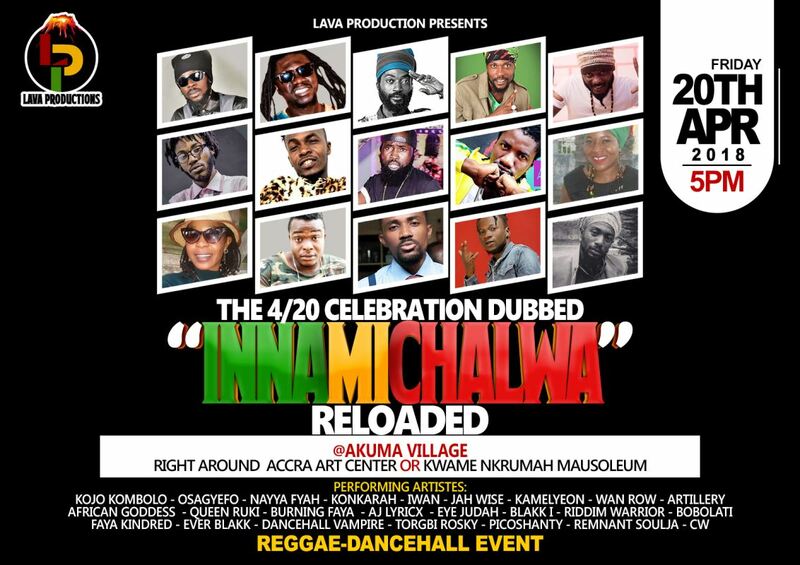 2017 - “Let It Burn"
2018 - "Inna Mi Chlawa Reloaded"
Previous editions of the "4/20" events are solely synonymous with stage performances, but this year's edition comes with a two-sweetner spice: one; a sound clash between Nature Won Int Sounds and Ras Nene Int Sounds purposely to serve the audience a feel of the reggae-dancehall sound system culture vibes and two; a set of 3 newly added artistes (Eye Judah, Kamelyeon and AJ Lyricx) who haven't been on any "4/20" stage before. Also a new entry, but sort of a prestigious guest, is Blakk I (a US-based Ghanaian reggae artiste). Some of the young artistes that are given the opportunity to come show their skills on stage are: Riddim Warrior, Torgbe Rosky (Ewe dancehall king) and Dancehall Vampire (a candidate of VGMA Unsung 2018). Iwan, Kojo Kombolo, Jahwise, Eye Judah, Osagyefo, Burning Faya, Konkarah, Nayah Fyah, Blakk I, Wan Row, Bobolati, Remnant Soulja, CW, Fyah Kindred, Kamelyeon, AJ Lyricx, African Goddess, Queen Ruki, Torgbi Rosky, Dancehall Vampire, Riddim Warrior, Picoshanty, etc.